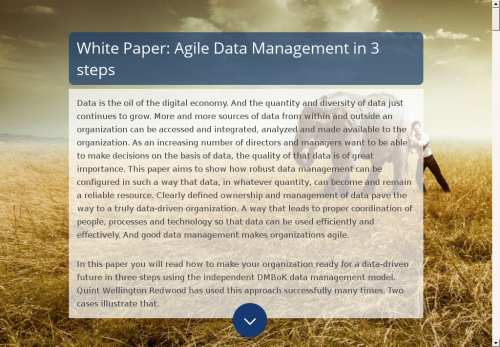 In this paper you will read how to make your organization ready for a data-driven future in three steps using the independent DMBoK data management model. Quint Wellington Redwood has used this approach successfully many times. Two cases illustrate that. Introduction: What is a data-driven organization? The term ‘data-driven’ means that a business or institution makes decisions on the basis of data, rather than on intuition or personal experience. This is also called fact-based or evidence-based decision-making. So, it is decision-making based on facts, at all levels of the organization: business strategy, marketing, sales, finance – in all business units and departments. Businesses that have started up since the turn of the century are almost all data driven: it is, as it were, in their DNA. And they have great success with new digital products and business models that allow them to derail existing markets and threaten the established order. This is not scaremongering, it is a fact. Half of the businesses on the Fortune 500 list in 2000 are no longer trading; the number of digital, data-driven enterprises is thus growing rapidly. That underlines the importance of digital services and data-driven decision-making. It implies that existing businesses need to transform into digital enterprises if they want to remain relevant in the digital age. Why become a data-driven enterprise? A growing number of organizations are discovering the potential of data. They play with data (and so-called ‘big data’) and realize that data-driven decision-making is of great benefit, and want to make even more use of data. They are aware that this places high demands on the quality and continuity of the data, and that it is absolutely imperative to set up their data management properly. In this endeavor, they have powerful support from the top. Or at least that’s the idea. Alas, in practice it seems that not all high-level managers realize that data is crucial to the enterprise as a whole, regardless of what people throughout the organization say or how passionately they advocate it. The plans for big data analytics also often appear to be no more than ambitions in an environment in which day-to-day business intelligence is not yet properly set up. One in which the springing of data leaks shows that data governance is a mess. And in which a data-driven approach is not on the board’s agenda. Senior leadership, an organization in which the processes are in line with the use of data, and good data governance are essential conditions for implementing a data-driven approach. Data is an asset, although many organizations fail to manage it in the same way as other assets, such as people, resources, capital, IT infrastructure and applications. Only then can an asset be valuable, and remain so. Good data management is essential to organizations. Organizations with well-structured governance, in which the ownership of data sets 1, 2 and 3 is crystal clear. Organizations in which it is clear what information needs special attention due to its mission-critical, distinctive nature: so-called ‘golden data’. Organizations that employ data professionals, not ‘data enthusiasts’. creates agility – when something has to be changed, that is possible. And it can happen relatively quickly. How mature is the organization? Once management has developed a strategy and vision on the use of data in the organization, the data revolution can commence. The primary question is whether or not the enterprise or institution is ready. Is everyone, at all levels of the organization, prepared to adopt a different working method? Is top-level management giving its unconditional backing? Are the processes by which this is to be achieved in place, and is IT ready? In other words, how mature is the organization and what steps need to be taken for data to be made into an asset? A tried and trusted method for determining this is to assume that the desired situation is up and running, and then backtrack to the current situation. This is a good way of accurately visualizing all the steps that need to be taken. Of course, that only works if the targeted to-be situation can be established accurately and independently. Storing large amounts of data is not a problem in technical terms. The problem of accessing and collating different data – from a range of sources, in different formats, and with varying levels of quality – is also one that can be resolved in technical terms. Strategic sourcing of IT services can help in that regard, for instance by outsourcing certain services and combining that with the infrastructure on site. The problem lies elsewhere. Not for nothing do we call it a data-driven organization. Becoming data driven demands different processes and working methods, different IT, and different skills and competencies. In short, a different way of thinking. At all levels of the organization. Without that revolution data will never become an asset: it will be a ball and chain. It is up to management to guide and supervise this process of culture change. The question is how an organization can gain control of the mushrooming quantity of data and the increasing number of data streams. Who is responsible for what, who does what and who is allowed to do what? What tasks can and are being differentiated and, more to the point, is there coherence and how can coherence be safeguarded? The Data Management Body of Knowledge (DMBoK) was developed by the DAMA International community. DAMA thus offers data professionals the world over a supplier-independent best-practice resource that covers all disciplines within the domain of data management. DMBoK is well on track to become the standard in the digital age. To-be situation: Using the strategy, vision and mission of the organization regarding becoming data driven, it is possible to determine the maturity level required to achieve the objectives. That too is done using the various individual levels of the DMBoK model. Roadmap: The output of the assessment and the desired situation can be converted into a practical roadmap that shows how processes, people and systems need to work to form a combined, data-driven organization. The assignment of responsibilities in this respect is crucial, as is the ability to think in terms of information chains, and viewing and treating data as a company asset. Assessment: determination of the current maturity level of the organization. Roadmap: the actions and measures to be taken in order to trace out the route from the current situation to the new one. As a supplier of drinking water Vitens has a great number of business processes, each of which demands a large amount of data that is growing by the day. Far-reaching automation and the use of sensor technology have made data an essential component of Vitens’s operations, with quality and availability being of singular importance, for instance, for predictive maintenance. What Vitens really wanted to do was to manage data as an asset, and to set up its data management professionally. As well as being a production business that pumps water to the surface, filters it and tests it in its own laboratory, Vitens is also a distributor, transporting water via its own network to consumers and charging them by means of water meters. Each of the required business processes uses large quantities of data which grow by the day. This, combined with far-reaching automation and the use of sensor technology, has made data an essential part of business operations. Management’s vision is that data is an asset, and therefore has to be managed. A large number of different types of IT converge within Vitens. As well as traditional IT, with back-office systems such as SAP and GIS, water production is also largely automated, and the network is now managed based on sensor data. The more processes that can be steered by data, the higher the quality of that data needs to be. An urgent need has therefore emerged at Vitens to gain full control of the data. “Data is one of our primary assets,” says Popke Graansma, Head of IT. “As such, it has been incorporated by senior management in the reformulated Vitens strategy.” To organize sound data management and ensure proper governance, he called in the assistance of Edwin Eichelsheim, consultant at Quint Wellington Redwood. Vitens’s Asset Management department is responsible for managing all assets, such as the pipeline network, the pumping stations and a host of filtering technologies, water softeners, etc. Furthermore, Vitens has a number of water production sites which are subject to specific legislation and regulations. This too is an important aspect for Asset Management. The board has followed up on the belief that data is an asset by assigning responsibility for data management to the Asset Management department. For the team, this is an entirely new discipline, and a number of data stewards have therefore been added. Despite the fact that data management is outside the IT organization, the IT department has provisioned the required infrastructure and application management processes expeditiously. The data analysis method is also based on DMBoK. The SAP BO BI tool was rolled out by IT to make it easier to access and combine certain data from a data warehouse. In relation to Geographic Information Systems, access has been improved to the extent that users can now present information at map level. With modern metering technologies and smart applications, Stedin Meetbedrijf provides companies with insight, an overview and a variety of ways to make energy savings. Stedin Meetbedrijf asked Quint to carry out an assessment to ascertain the maturity level of its data management. Among other things, this study would help the further development of business services based on data. It thus marks the starting point of the road to a new, data-driven enterprise. Edwin Eichelsheim of Quint Wellington Redwood was asked to perform the assessment in the second quarter by Ashwand Prahladsingh and the then director of Stedin Meetbedrijf. He investigated the maturity of data management in the organization. This is important because a high level of data management maturity is needed to execute the envisaged strategy, and to make Stedin Meetbedrijf a data-driven organization. Based on the Data Management Body of Knowledge (DMBoK), Eichelsheim observed that for most DMBoK focus areas, the company had a maturity level of 1. One of the things that this tells us is that the data vision has not been properly formulated as a business case, something that would help the company as a whole to adopt a data-driven approach, and that data management is therefore in its infancy. In terms of compliance, security and privacy, in contrast, the company was performing particularly well. Based on DMBoK, Quint also provided a roadmap for data management for newly introduced services and products. The assessment gives Stedin Meetbedrijf a solid foundation for making further progress, and there is still much work to be done. In accordance with its mission statement, Stedin Meetbedrijf has the ambition to become a data-driven organization. The initial applications of data analyses were primarily aimed at improving internal processes. Workflow analyses, marketing, data validation, portfolio analyses and organizing the billing process have already led to many improvements and savings. The next steps encompass developing products and services based on data. Although – unlike in the consumer market – regulation is not an issue, the confidentiality, security and quality of the data is obviously the top priority. A specific example of a newly developed business service: with the customer’s permission, the consumption history – sometimes going back as many as eight years – is examined to assess whether the capacity contracted with the network operator differs from average consumption. Adjusting the contracted capacity could lead to big cost savings for the customer. A simple example, but the idea is to apply advanced analytics to all available data to identify divergent consumption patterns for customers. Have circumstances changed, or have things remained the same? Have there been any cases of fraud or abuse? Business customers benefit from this.